The General Data Protection Regulation came into force in May 2018. It will still apply even though Britain is leaving the European Union. It applies to any organisation processing and holding personal data. Personal data is any information related to a natural person, that can be used to directly or indirectly identify the person. It can be anything from a name, an email address, bank details, posts on social networking websites, medical information, or a computer IP address. How can Charitylog help charities with GDPR? You can define the types of data (e.g. personal data such as gender, ethnicity, medical data, financial data) viewable at a user level. Users only see the information they are entitled to, which may differ by service. There is also a section to display the types of information that is not available to them. For external referrals, you can control which consents are needed to refer to any external organisation, record whether the client has given this consent and issue a clear warning if this has not been given. This offers an efficient way to record consent GDPR. Individuals can easily view the data held on the system via printouts. 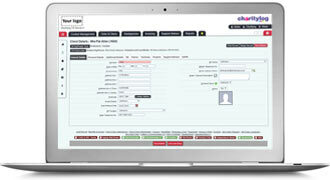 Our Print Client Record function allows you to include all the relevant data. With the Anonymisation function, you can delete any identifiable data, while leaving an identifier so that historical reports are still correct. You can also search for clients where there has been no contact for a defined period. There is a requirement to export the data in a 'commonly used machine-readable format'. CSV, XML, or Excel are acceptable. The Print Client Record feature has a handy Excel export option for this. A user-defined template library will allow predefined fields to be exported. This avoids the need to repeatedly choose the information you need. Our management database makes charity GDPR compliance simple.